Back in March, task-management app Todoist for iOS received its largest update ever, making it it easier to use, more functional and a lot prettier to look at, too. Now, it’s Android‘s turn. 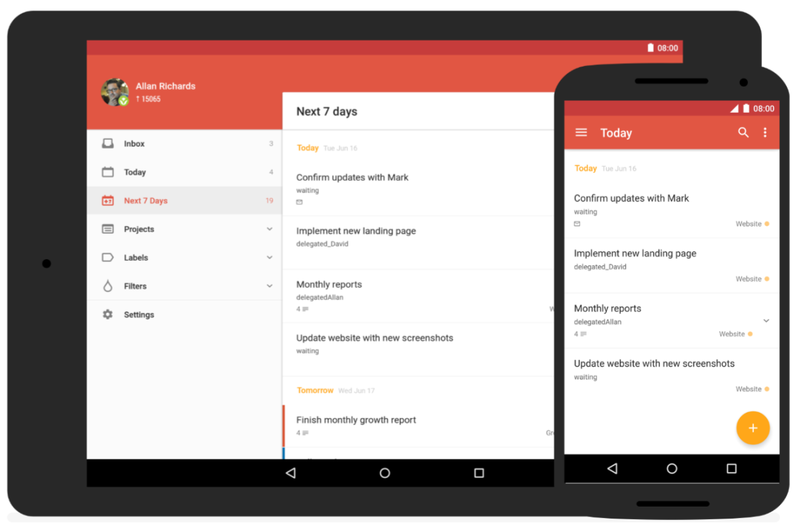 The most obvious change in the new Todoist for Android is its Material Design makeover. Gone is the old drab utilitarian look in favor of Google’s colorful new design ethos – and you even get 10 new color themes to choose from. Aesthetics aside, Todoist says the redesign has involved rewriting most of its app’s UI to incorporate the latest code to make sure it works smoothly. There are a lot of new features as well, some of them introduced with the aforementioned iOS update. Todoist can now parse dates from natural language, meaning you can type in something like “go for a walk every morning at 8 AM” into the task field, and the app will automatically add all the relevant details to a new task. You can also now add start and end dates for recurring events, useful if you only need to do them for a limited amount of time. Todoist is also making it easier to organize new tasks into subtasks. When you’re in quick-add mode, you just need to swipe left or right to convert a new task into a subtask and control a project’s hierarchy. You can now add collaborators right from the new project screen (instead of adding a task first and then clicking on the share button), while new gestures on the task view screen allow you to swipe left to schedule an item or swipe right to to mark it as complete. It’s a neat update – all the smooth animations you’d expect from Material Design are in tow, and the improved task management features make it both more powerful and easier to use. The changes are rolling out to Android users via the Google Play Store today.